opinion of the missing-persons scene down east. 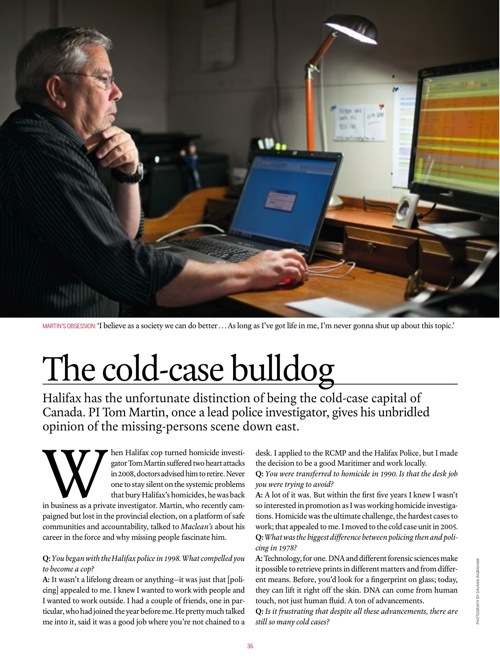 When Halifax cop turned homicide investigator Tom Martin suffered two heart attacks in 2008, doctors advised him to retire. Never one to stay silent on the systemic problems that bury Halifax’s homicides, he was soon back in business as a private investigator. Martin, who recently campaigned but lost in the provincial election, on a platform of safe communities and accountability, talked to Maclean’s about his career in the force and why missing people fascinate him. Q: You began with the Halifax police in 1998. What compelled you to become a cop? 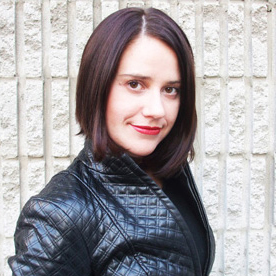 A: It wasn’t a lifelong dream or anything—it was just that [policing] appealed to me. I knew I wanted to work with people and I wanted to work outside. I had a couple of friends, one in particular, who had joined the year before me. He pretty much talked me into it, said it was a good job where you’re not chained to a desk. I applied to the RCMP and the Halifax Police, but I made the decision to be a good Maritimer and work locally. Q: You were transferred to homicide in 1990. Is that the desk job you were trying to avoid? A: A lot of it was. But within the first five years I knew I wasn’t so interested in promotion as I was working homicide investigations. Homicide was the ultimate challenge, the hardest cases to work; that appealed to me. I moved to the cold case unit in 2005. Q: What was the biggest difference between policing then and policing in 1978? A: Technology, for one. DNA and different forensic sciences make it possible to retrieve prints in different matters and from different means. Before, you’d look for a fingerprint on glass; today, they can lift it right off the skin. DNA can come from human touch, not just human fluid. A ton of advancements. Q: Is it frustrating that despite all these advancements, there are still so many cold cases? A: For me, personally, yes, it’s extremely frustrating. I know that the talent is there, but it’s only recently that management has got behind the idea that we need to focus on these outstanding homicides and missing persons. Q: I notice you didn’t call them “cold cases”—in fact, it’s been reported that you hate the term. Why? A: “Cold case” is an insult to the people in the family. There should be nothing cold about them. “Cold” was a slang put onto it years ago, and I find it disrespectful. But it’s reflective of the time, energy and resources being put into these cases. After 15 years, I was never able to get an exact answer of when someone decides it’s a “cold case,” which means it’s going into a box somewhere. If a tip comes in, they’ll follow up, but the case is not actively being worked. That’s part of the mistake we’re making. Q: Halifax’s Regional Police site lists 63 unsolved homicides dating back to 1955. How does that number compare to other cities? Q: So, what happened there? A: Homicide can become accidental death, suicide, etc. Policy all across this country is that all deaths are to be treated as a homicide until proved otherwise. Some places have veered away from that basic point. Halifax is definitely one of those places. Q: Does Halifax suffer from a double whammy since, with the high crime rate, they also have a low clearance rate of solved cases? A: In my opinion, Halifax has a very low clearance rate. Commitment from management is one reason for it. Experience has retired or gone out the door. That’s not to say there aren’t great people; there are. But people move into homicide, stay a few years, then move on to something else. Similarly, police management minds often think [unsolved] cases are cold anyhow, so let’s move onto something new. Q: What’s it like to have to tell a family that not only is the case unsolved, but it might never be solved? A: It was very frustrating. When I retired, I saw the numbers and I saw the lack of concern on the part of management to address the issues, and that’s when it got more frustrating. Talking to the families, you often hear, “All we want is closure.” You can bring the case before the courts, you can get a conviction, and you talk to the families a few months or years later and they’ll tell you there’s really no such thing as closure, only justice. It’s an essential component to the process, because in our society no one gets away with murder. 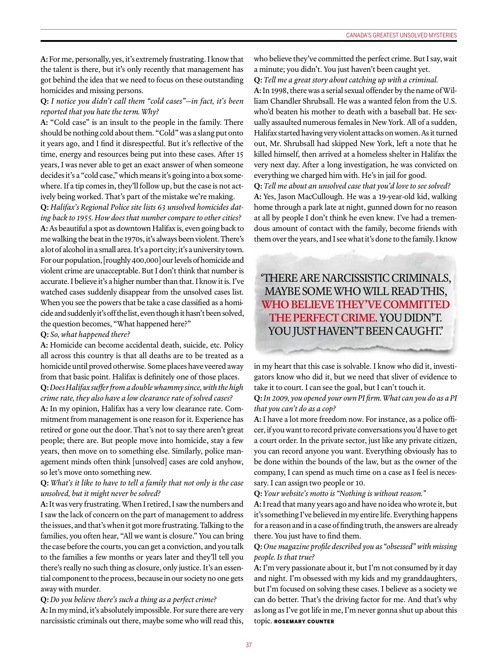 Q: Do you believe there’s such a thing as a perfect crime? A: In my mind, it’s absolutely impossible. For sure there are very narcissistic criminals out there, maybe some who will read this, who believe they’ve committed the perfect crime. But I say, wait a minute; you didn’t. You just haven’t been caught yet. Q: Tell me a great story about catching up with a criminal. A: In 1998, there was a serial sexual offender by the name of William Chandler Shrubsall. He was a wanted felon from the U.S. who’d beaten his mother to death with a baseball bat. He sexually assaulted numerous females in New York. All of a sudden, Halifax started having very violent attacks on women. As it turned out, Mr. Shrubsall had skipped New York, left a note that he killed himself, then arrived at a homeless shelter in Halifax the very next day. After a long investigation, he was convicted on everything we charged him with. He’s in jail for good. Q: Tell me about an unsolved case that you’d love to see solved? A: Yes, Jason MacCullough. He was a 19-year-old kid, walking home through a park late at night, gunned down for no reason at all by people I don’t think he even knew. I’ve had a tremendous amount of contact with the family, become friends with them over the years, and I see what it’s done to the family. I know in my heart that this case is solvable. I know who did it, investigators know who did it, but we need that sliver of evidence to take it to court. I can see the goal, but I can’t touch it. Q: In 2009, you opened your own PI firm. What can you do as a PI that you can’t do as a cop? A: I have a lot more freedom now. For instance, as a police officer, if you want to record private conversations you’d have to get a court order. In the private sector, just like any private citizen, you can record anyone you want. Everything obviously has to be done within the bounds of the law, but as the owner of the company, I can spend as much time on a case as I feel is necessary. I can assign two people or 10. A: I read that many years ago and have no idea who wrote it, but it’s something I’ve believed in my entire life. Everything happens for a reason and in a case of finding truth, the answers are already there. You just have to find them. Q: One magazine profile described you as “obsessed” with missing people. Is that true? A: I’m very passionate about it, but I’m not consumed by it day and night. I’m obsessed with my kids and my granddaughters, but I’m focused on solving these cases. I believe as a society we can do better. That’s the driving factor for me. And that’s why as long as I’ve got life in me, I’m never gonna shut up about this topic.